When it comes to business books, I occasionally get skittish. It’s just the same old stuff over and over, so I often refuse to review such books. This book was a rare gem for me; it even made me wish that I had worked for the author. There are two classic models for maximizing value in enterprises: 1) low cost, high volume, and 2) high quality, reasonable cost. My Dad ran a business that was the latter, and on a far larger level, so did Morton Mandel. Customer service was what he focused on, and listened to customers in order to see what problems they might have that his firm might solve. More, he created a culture that would focus on the customer. That required hiring good businessmen — men who could run almost any business, once they understood the industry. Such men could do people management, project management, financial management, and have a strong ethical slant. You are managing for the long-run, not the short run. You do not want management that cuts corners. When I was 17-18 years old, I was the student representative to the School Board from my high school for two years. In the meeting room, there was a prominent painting by some student that had the bold title “What’s best for the Kids?” So it was for managers in Mandel’s company — “What’s best for our Customers?” Such an attitude, inculcated through the organization created extreme customer loyalty, employee loyalty, and significant profits. From my own work in the insurance industry, I have experienced many cultures. I can smell a bad management team and culture a mile away. I invest in the best cultures that I can find in the insurance industry. In any industry, when I find companies that I think do it right, treating all stakeholders well, I am quick to buy the stock, and slow to let it go. To give an example, in 1994, I did a deep study of the trucking industry, and I came away with one firm that did it all right — a strong focus on safety, good incentives for drivers and terminals. I bought, the stock doubled in a year, and was bought out by a private equity group. Ethics in business pay off. Good service to others will receive its reward. And so it was for Morton Mandel. Superior customer service led to loyalty of customers and good margins. Mandel was also smart about acquisitions. He would buy small companies with desirable characteristics, and then improve their management team and grow them organically. He never bet the company. Did he ever make mistakes? Yes, and he made a big one when he mis-estimated a guy to whom he sold his firm. He thought the guy would preserve the culture of the firm, and it was anything but that. Within a year, the combined firm was suffering, there was a boardroom coup, and Morton Mandel, far from retiring, was back as CEO repairing the damaged firm. He was big on standardizing best practices, so that everyone in the firm would know the best way to serve customers. Also, he was big with charitable enterprises, and realized that most of the principles that applied to for-profit companies applied to non-profits. The main idea is this: if you focus on doing quality work for your customers, and charging an appropriate price for it, you will prosper. Would that more companies would do it. I forgot one thing — his close relationship with Peter Drucker, my favorite expert on management. The two were close to a degree where Drucker would give Mandel advice he would not give others, but only because Mandel was capable of receiving it. Drucker thought Mandel was one of the top managers in America. That in its own right should recommend this book to you. Who would benefit from this book: Anyone would benefit from this book, it is that good. 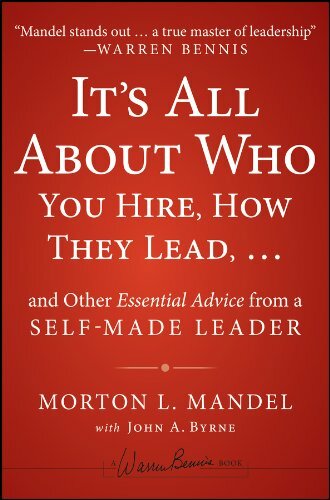 If you want to, you can buy it here: It’s All About Who You Hire, How They Lead…and Other Essential Advice from a Self-Made Leader. Full disclosure: I received a free copy from the publisher.